El Capitan has arrived. Several months after being unveiled at Apple's Worldwide Developer Conference in June, and having been available as a public beta all summer, Apple shipped El Capitan at the beginning of October. Is it worth the wait? Is it safe to upgrade? Should you take the plunge? Read on and find out. Looking to upgrade to El Capitan? Here's how to get it. Last year, Apple, with Yosemite, gave OS X's user interface a huge overhaul. So it's no surprise that El Capitan sees a a refinement of that rather than another re-design. The most obvious and significant change is to the system fault. Having used Helvetica Neue for several years, Apple has swapped to San Francisco, the font introduced on Apple Watch and now also used in iOS 9. While font geeks will continue to argue over whether it's a change for the better or worse, most users will barely notice the difference. To us, however, San Francisco looks terrific on a Retina display. El Capitan also improves the way Mission Control handles windows. Swipe upwards with three fingers and it shows all the windows in your current Space (Apple's name for virtual desktops). Other Spaces are displayed as thumbnails in a bar along the top of the screen and if they have a full-screen app, the Space is named after that app. You can make any open app full-screen (if it supports it) by dragging its window into the bar. Several of OS X's apps get an upgrade in El Capitan. Notes is completely over-hauled, to match the version included in iOS 9. It's now much closer to tools like Evernote and OneNote. You can create checklists, add web pages, and share maps and other documents to it. It also now supports images, drawings, PDFs and videos. Photos now has support for third party extensions for image editing. Some of these are bundled with third party apps, like Affinity Photo. Others can be downloaded separately from the App Store. Maps gets public transport directions, though only in major cities. As far as the UK is concerned, that, for the moment, means London and only London. It's a terrifically useful feature, particularly as Calendar can use it to calculate how long it will take you to get to an appointment and alert you before you have to leave. We hope it will be rolled out to other towns and cities soon. Safari, praise be, gets a mute button. You can now mute any tab at the click of a loudspeaker icon in the address bar. No more hunting around for adverts on a web page to find out which one is playing noisily. Tabs can now be 'pinned' so they always stay in your tab bar. And you can now 'cast' (or mirror in Apple parlance) a web page to Apple TV using AirPlay without having to send the whole desktop. Mail gets new gestures for marking messages as read or unread and for deleting them. Split View is the biggest improvement in usability. It allows you to view windows from two different applications, or from the same application, side by side in full-screen mode. It only works with applications that have enabled support for it, but that includes many big names like Microsoft's Office apps, for example, along with Apple's own apps, and one of our favourite writing tools, Scrivener. To enable Split View, you just click and hold on the green button at the top left of one of the windows you want to see on screen. It then shrinks away to the left of the screen, allowing you to click on the window you want to see alongside it. Once Split View is running, you can drag the dividing line between the windows left or right to alter the space taken up by each. It's a great way to research while you write, or keep an eye on a group chat or web conference while you work. 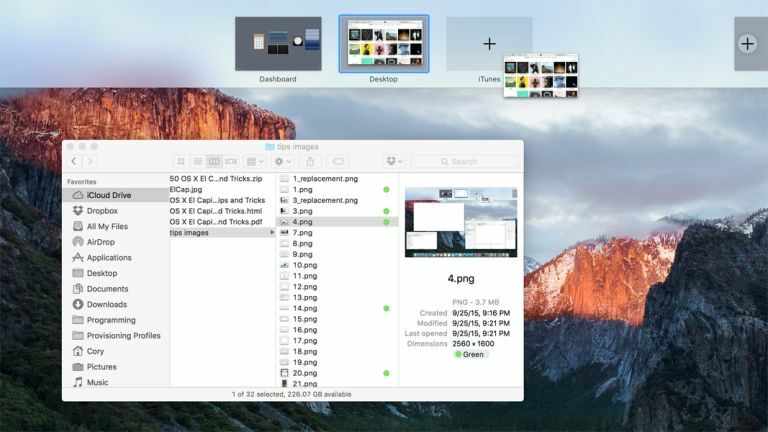 Spotlight, which had a huge upgrade in Yosemite, gets more improvements here. There's support for natural-language searches – eg 'show me photos from last July' – and you can now also look for enhanced weather forecasts, stock prices, and web videos. Surely it can't be long before Apple goes the whole way and adds Siri to OS X? Spotlight's window is no longer fixed; you can re-size it vertically to see more results and drag it around the screen. Apple claims apps load 1.4 times faster in El Capitan than they did in Yosemite, though like all claims of that kind, you should take that with a large dose of salt. We performed a clean install on our 2013 MacBook Pro, purging all traces of previous operating systems and all the other files and caches that build up over time. iMac with Retina 5K dispay review: is this the ultimate Mac? Running El Capitan certainly 'felt' faster after that, but your mileage will vary. The good news is that if you do run into performance lag problems, the 'spinning beachball' has been re-designed, so you'll at least have something new to look at. The not so good news is that there have been reports of apps running into problems in El Capitan. Most notably, Microsoft's Office 2011 and 2013 apps, particularly Outlook. Fixes from Microsoft are on the way, and may well have been issued by the time you read this, but you should check if apps you use regularly have any documented issues before you upgrade. El Capitan is all about refinement and the tweaking of features and improvements add in Yosemite. With the exception of the new Notes app and Split View, there are few compelling reasons to upgrade. On the other hand, it's free, has lots of smaller improvements, and pulls OS X and iOS 9 even closer together. Importantly, however, Apple continues to take a different path from Microsoft, keeping its desktop/notebook and mobile operating systems separate and distinct from one another. The new OS is a perfect complement to Apple's increasing range of Retina Macs, which now includes a 21-inch iMac, and while no-one will buy a Mac because of El Capitan, as a partnership, Apple's Mac hardware and software has never been stronger. What was that about Macs not being targeted again? iPhone 5: When is it out?